Orbis was selected to design and build two 16 foot diameter world globes for the 2002 Winter Olympic Games. 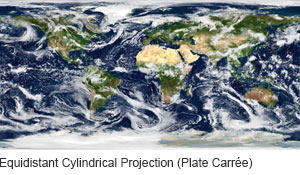 Through a unique collaboration with NASA, Orbis transformed NASA Satellite Imagery – the latest generation of “Blue Marble” data, into incredibly accurate spherical globes of planet Earth. 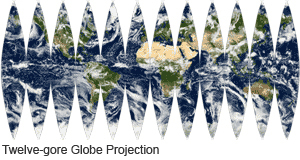 This gigantic mosaic photograph consists of thousands of individual images taken from an orbiting array of satellites, and features Orbis Cloudforms™, the most photorealistic depiction of our world’s atmosphere ever created. Using proprietary digital cartographic tools, the Earth image is transformed into football-shaped segments (gores) which are printed onto flat fabric material and assembled into giant spherical Orbis world globes. 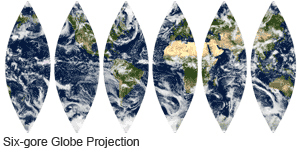 The six gore projection is used to make Orbis 16″ and 1 meter diameter EarthBalls, and the 12 gore projection is used to produce Orbis Giant EarthBalls.